Just steps from the White House, on busy Pennsylvania Avenue, is a new and marvelously cheesy spot to get a quick bite for lunch or to enjoy a leisurely happy hour. Grilled Cheese DC, a grilled cheese bar, serves up gooey sandwiches for the noon crowd and transforms into a cheese and cocktail bar in the evening. Cheese lovers will be in heaven, as the lunchtime options range from basic to veggie-packed to meaty grilled sandwiches, and the happy hour options focus on beautiful cheese and charcuterie plates. At Grilled Cheese DC gluten-free options achieve the trifecta: delicious, safely made, and worth going back for seconds. Sandwiches are made with bread from local producer Goldilocks Goodies, sliced thick to support all of the tasty fillings inside. Gluten-free preparation already appears to be a well-oiled process, as sandwich makers automatically change gloves before handling bread and prepare each sandwich on a separate tray. Of course, it’s always important to ask about gluten-free preparation and confirm your needs with the staff when placing your order. Have you ever ordered a gluten-free meal and had to pay extra for your food restrictions? 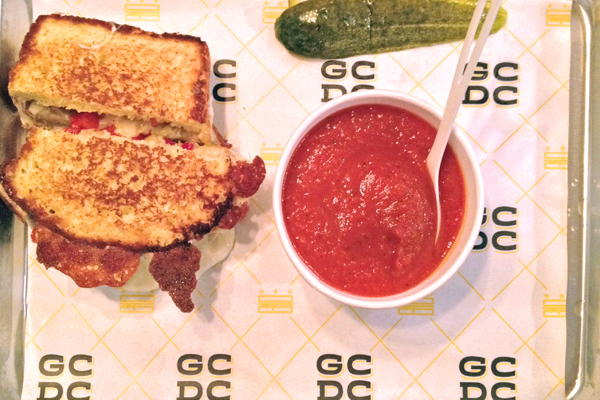 At Grilled Cheese DC gluten-free eaters are actually rewarded with an additional bonus and are given the choice of a cup of housemade soup or a gluten-free cake cup from local bakery Cakelove. In this case, the tomato soup provided the perfect complement to the Mediterranean sandwich, with its artichoke- and pepper-studded mozzarella goodness. With all of the tasty gluten-free options at GCDC, it’s best to go with a group for maximum sampling. Grab a friend and indulge in this cheesy lunch or make cocktails and a cheese plates your happy hour plan. 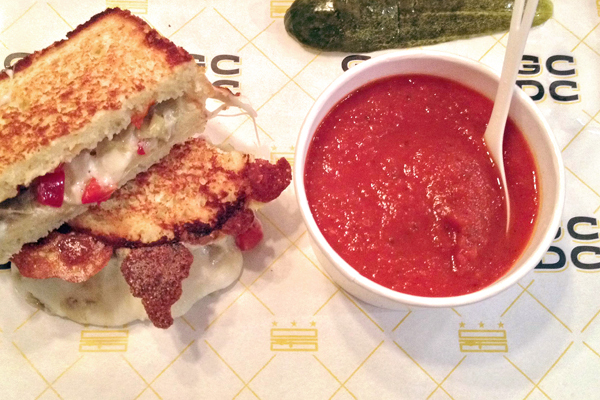 Either way, cheese lovers, what are you waiting for? Where? 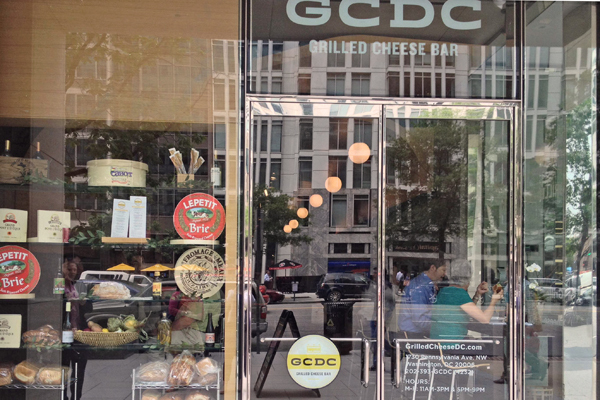 Grilled Cheese DC is located near the White House: 1730 Pennsylvania Ave, Washington, DC (202-393-4232). My husband and I are often in DC. The last time we went, we hit up Wicked Waffle for gluten-free waffle sandwiches, but I am MUCH more partial to grilled cheese. We’ll have to keep this place in mind for our next DC trip. Thanks for the tip! Hope you enjoy your grilled cheese! I’m a fan of both GCDC and Wicked Waffle. The more GF variety the better! I am so excited to hear they have a gluten-free option! I read a review of the restaurant and had to sigh, thinking they would not be a good place to visit. Thanks for reading, Kelly! GCDC has kept their GF sandwiches quiet for some reason, as if they don’t know how hungry the GF crowd is for a good grilled cheese. Hope you love it! This looks DELISH! We visit DC a couple times a year so I’ll have to stop in and give it a try. Thanks for sharing!